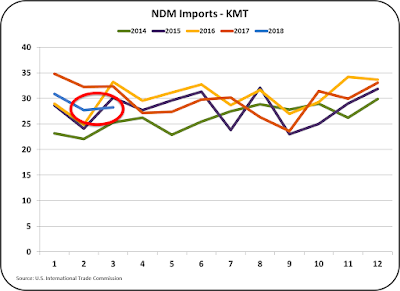 MilkPrice: March Dairy Exports are Amazing! 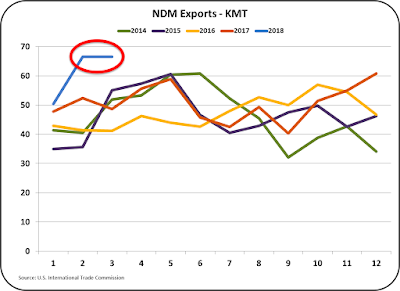 Dairy export/import data for March is very positive. However, even more improvement is needed to balance demand with milk production. As shown in Chart I below, exports have risen by about 2% of total solids production in the last six months. In October 2017 15.2% of milk solids were exported. 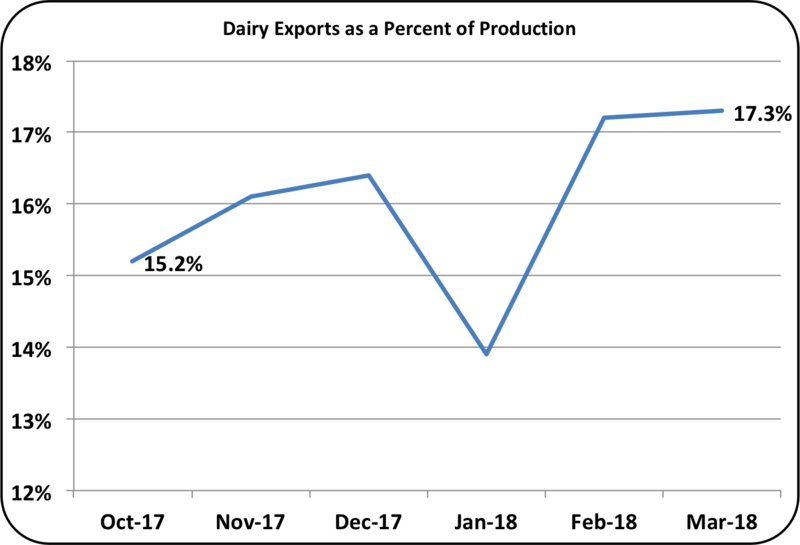 By March 2018, those exports have increased to 17.3% of milk solids produced. This has helped find a home for a significant amount of U.S. milk. But U.S. dairy inventories are still high as covered in the May 6 post to this blog. Cheese pricing is key to producer milk prices. 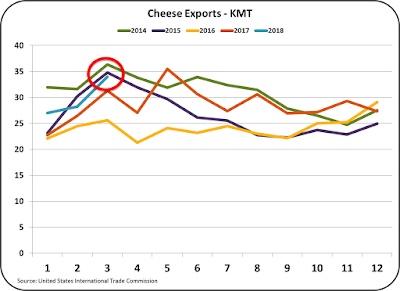 Cheese exports have been increasing (Chart II) but are still below 2014 and 2015 levels. 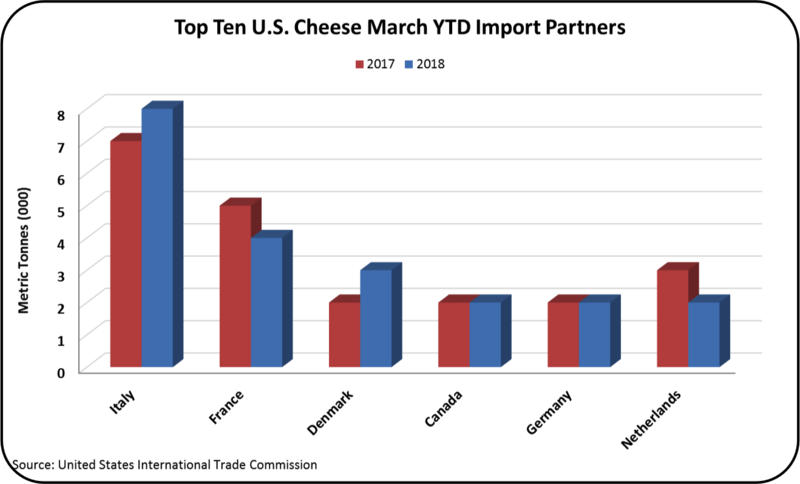 March exports represent 6.8% of U.S. cheese production. 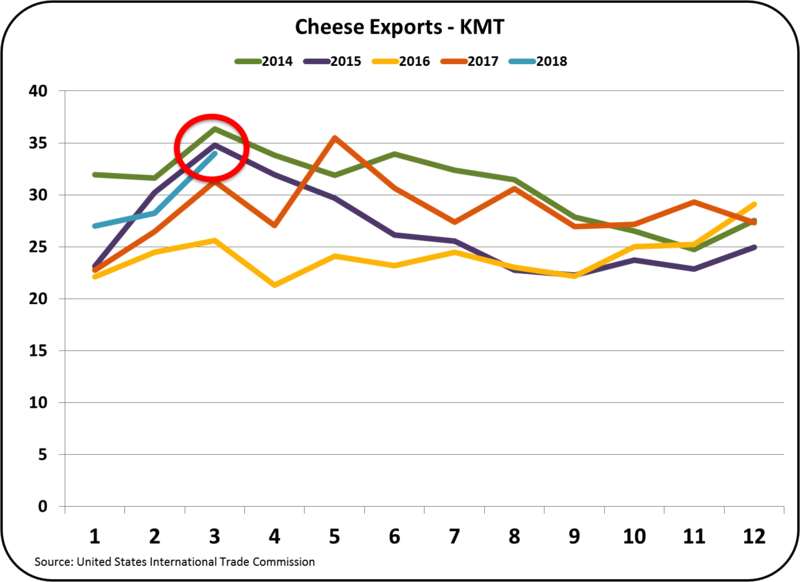 The increase in cheese exports are preventing further growth of cheese inventories, but even more exports are needed to reduce the inventory levels. Cheese inventories are too high and that is keeping cheese prices and Class III milk prices low. See the March 12, 2017 post for an explanation of the link between the cheese price and the Class III milk price. 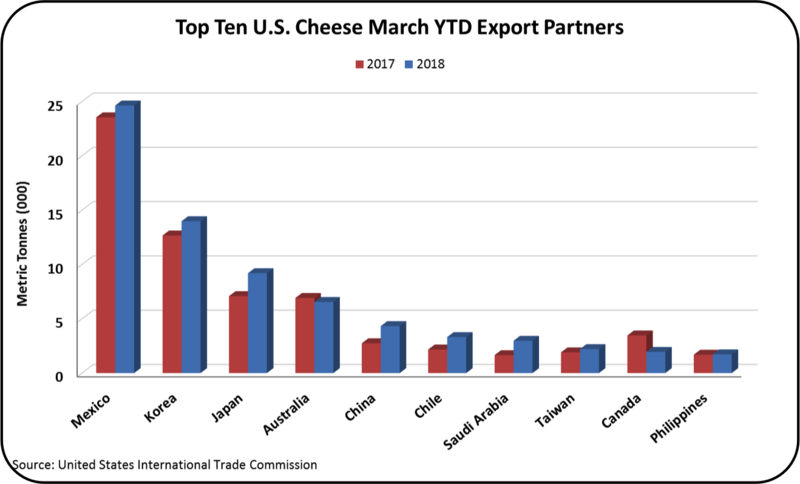 Where are cheese exports going? 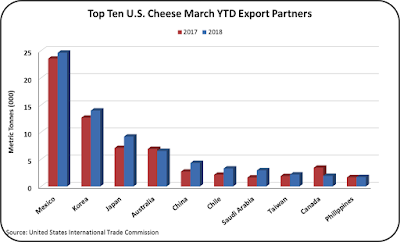 Mexico is always by far the largest importer of U.S. cheese, but a lot of the growth is also coming from exports to South Korea and Japan, half way around the globe. There have also been nice increases in cheese exports to China, Chili, and Saudi Arabia. Diversification in the countries buying U.S. cheese should provide more long-time stability in exports. Cheese imports (Chart IV) are at 2014 levels, and well below the levels of the last four years. 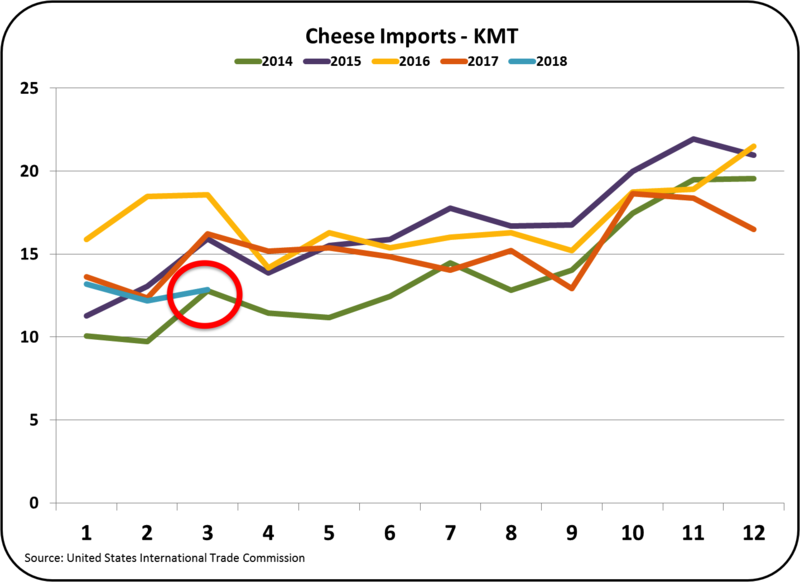 Hopefully, cheese imports will fall further in the coming months to record low levels. 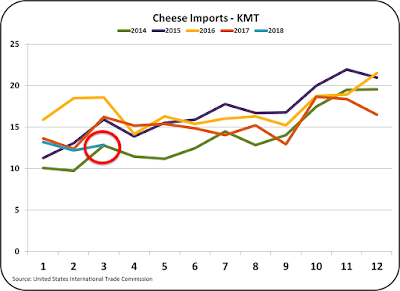 The overall decrease in imports results from the reduced YTD imports of cheese from France and the Netherlands (Chart V), offset somewhat by increases from Italy and Denmark. 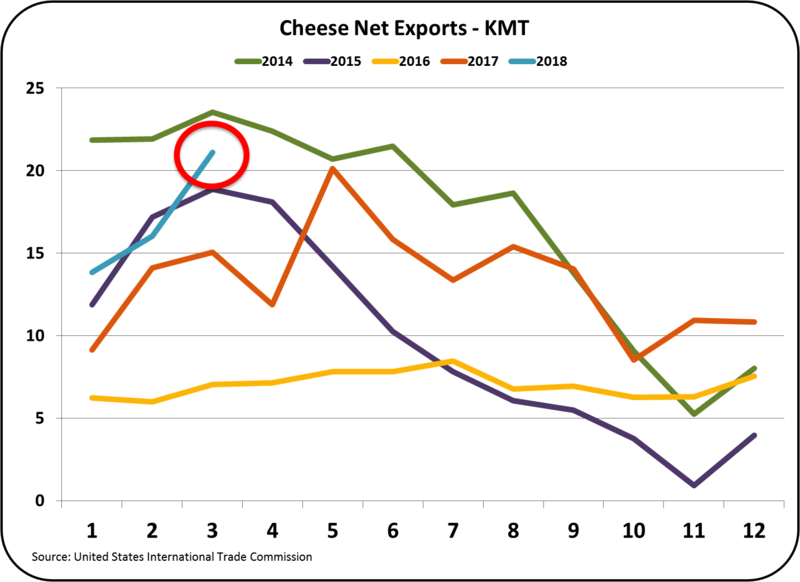 Combining increased exports and decreased imports of cheese gives cheese net exports a nice boost for March. 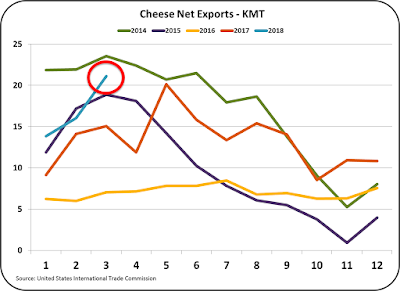 Cheese net exports (Chart VI) are still below 2014 levels, but the increases from prior months and the last four years is dramatic. March 2014 was an all time record for cheese exports and therefore set a very high comparative benchmark. 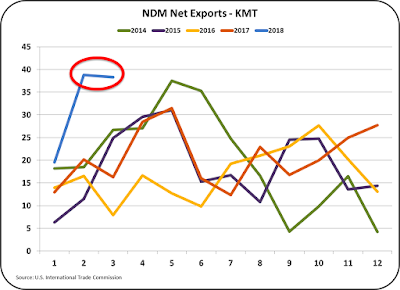 In the coming months, there is a real opportunity to set new monthly record highs of net exports of cheese. 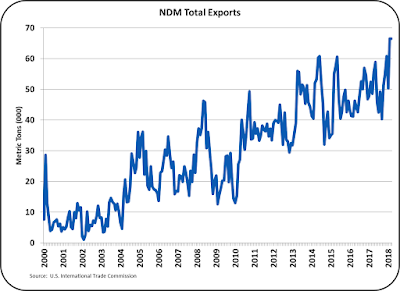 To emphasize the record exports of NDM/SMP, Chart VIII shows the growth of NDM/SMP exports over the last 18 years. The February and March 2018 exports are not just records, but very strong new record highs. 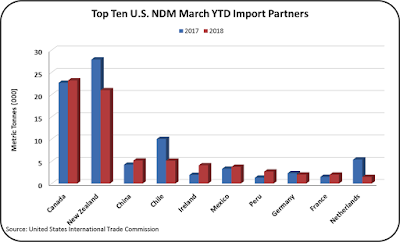 The exports of NDM/SMP to Mexico (Chart -IX) are huge and continue to grow. Especially in the southern areas of Mexico where refrigeration for milk is limited, NDM provides an alternative that is inexpensive, can be stored without refrigeration, and can be rehydrated as needed. 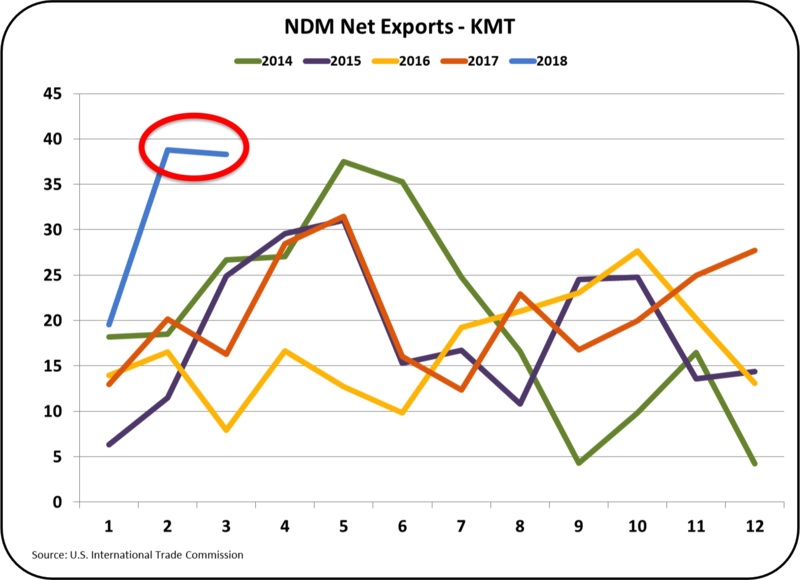 The overall increase in YTD NDM/SMP exports is lead by Mexico, combined with nice increases sent to Indonesia, and Vietnam. 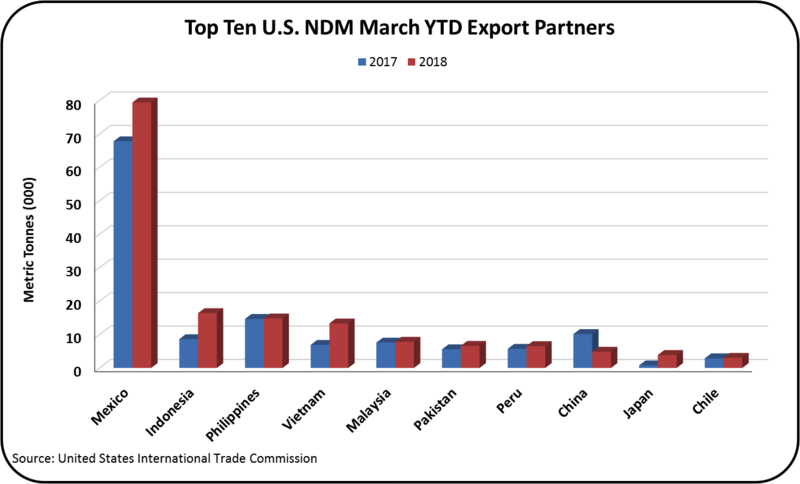 A favorable conclusion to NAFTA is important for the continued growth of this market. 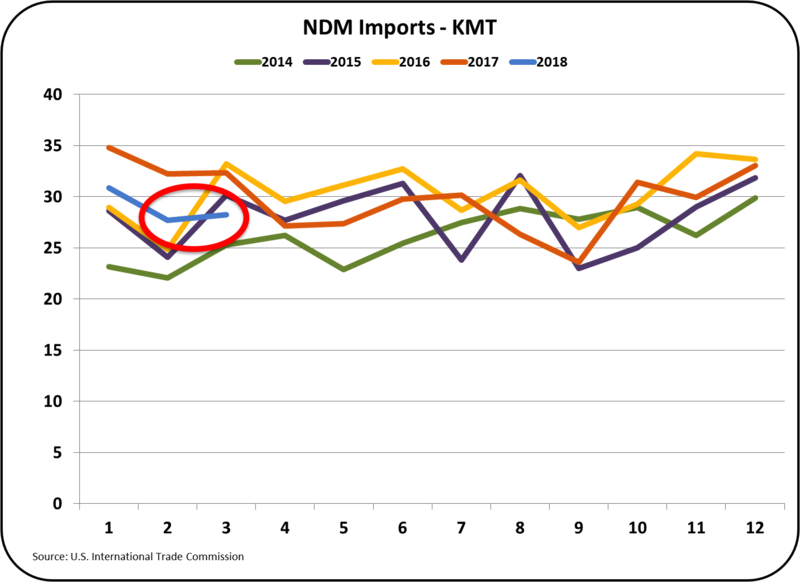 U.S. imports of NDM are down as shown in Charts X and XI. 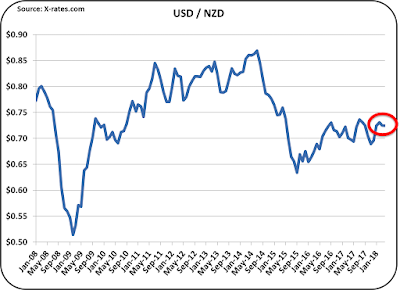 Most of this reduction comes from decreases in imports from New Zealand and Chili. 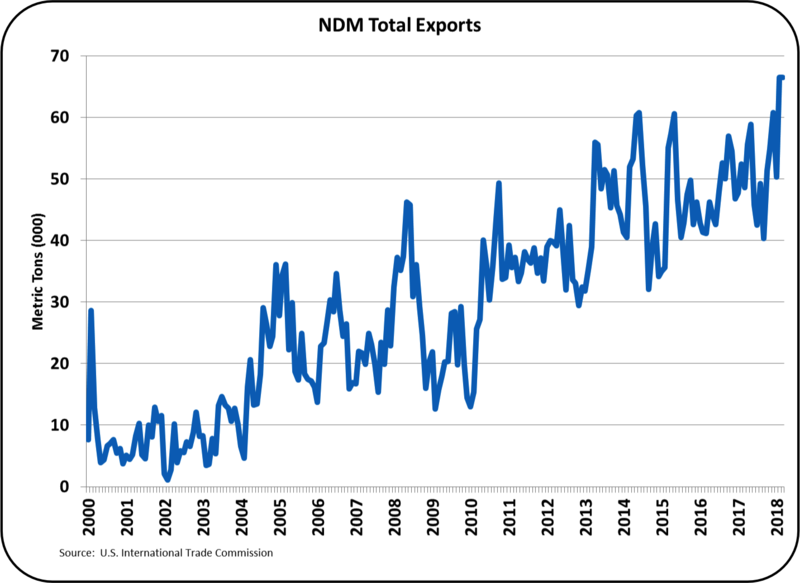 The combined high exports and low imports combine to achieve record highs for NDM/SMP net exports (Chart XII below). 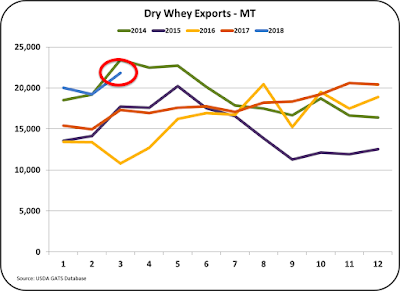 Exports of dry whey (Chart III) remain near record highs. Dry whey is the basis of pricing for "Other Solids" pricing. 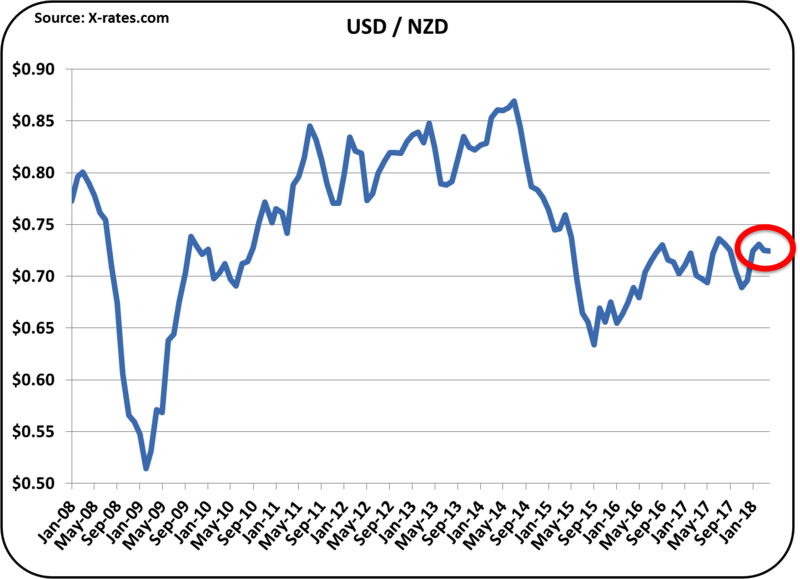 Exchange rates for the two largest international dairy competitors show a slight strengthening of the USD. 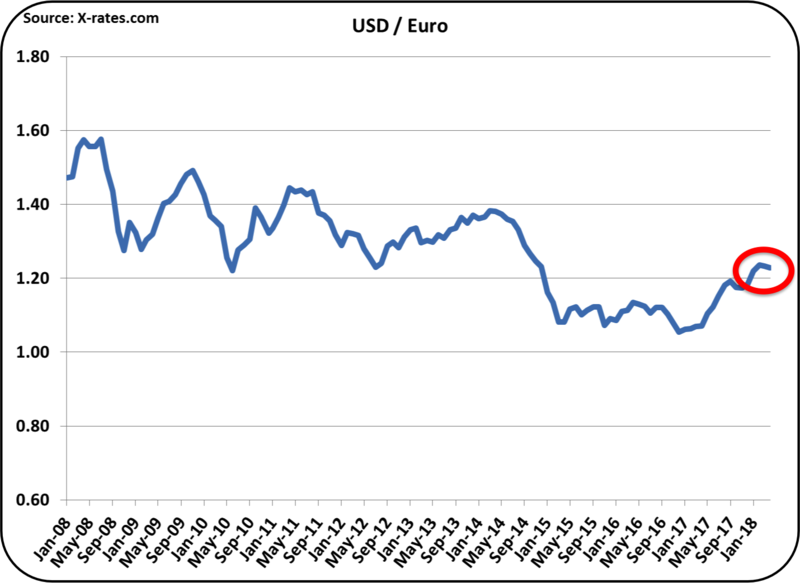 A stronger USD makes U.S. products less financially competitive. 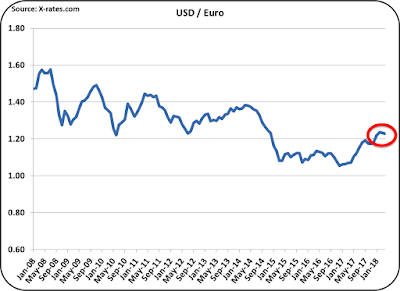 However, the change is small, and the USD remains significantly weaker than a year ago. 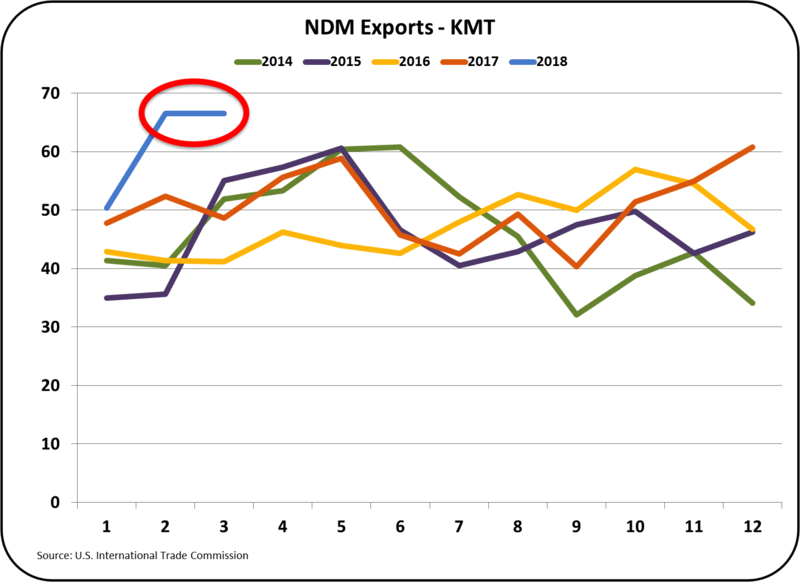 U.S. dairy exports show very nice increases for the first quarter of 2018 as the USDEC continues its quest for the "next 5%." 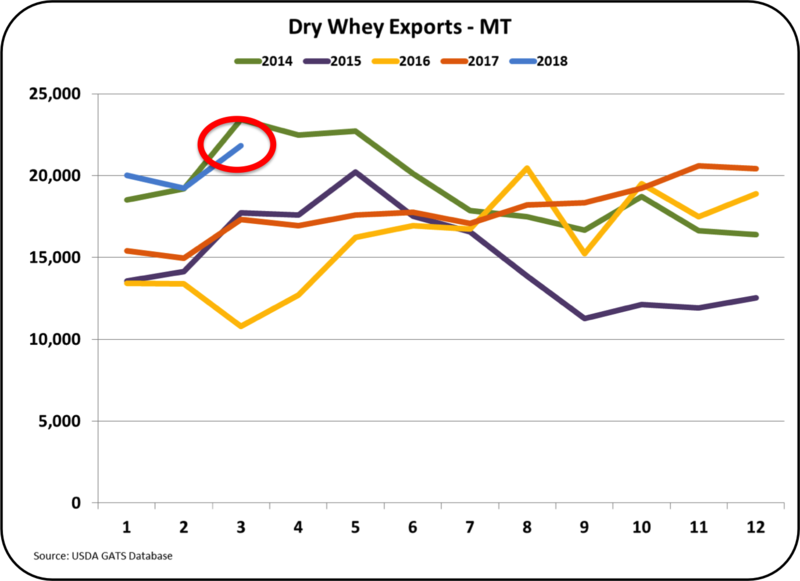 Inventory levels remain high, but the current dairy export increases appear to have prevented further growth in inventories. To reduce the high inventories, even higher levels of exports will be needed. This very important parameter will continue to be followed in the blog. John, as always, another well-written post! 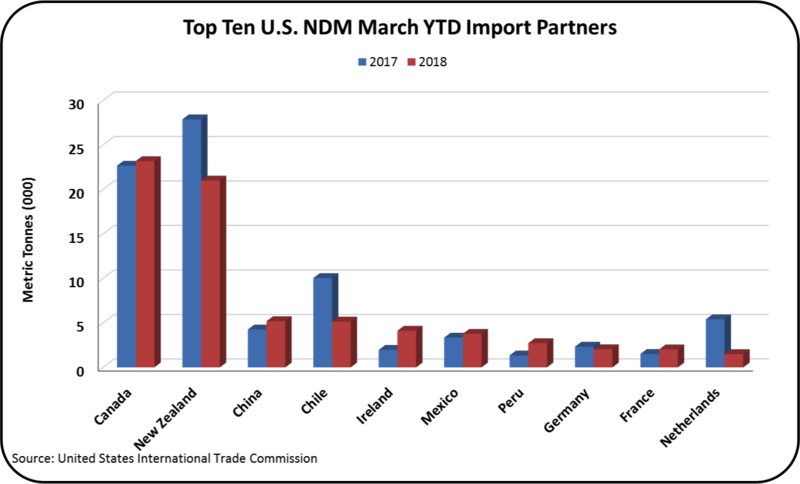 Really appreciate your blog with your keen insights how the global market impacts U. S. milk production. Good news today for dairy producers who have been battling low milk prices. 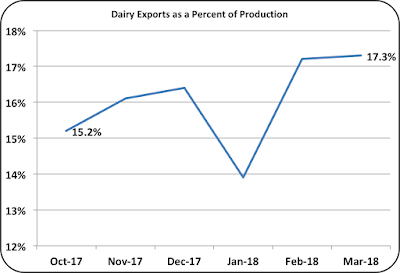 Hopefully, growth in exports will continue along with increased domestic use to help reduce inventory and increase milk prices to a more profitable level. Thanks!